If it weren’t for my homemade soap scum remover, we’d have to remodel the bathroom. I mean it. See, I hate our glass shower door! Some things a girl just wants to keep hidden…like how her flabby bits wobble when she bends to shave her legs. Or how much soap scum collects on the shower doors between serious cleanings. Well, I haven’t had much luck doing anything about the flabby bits, but this mix sure got rid of the soap scum fast! Why does soap scum form? Not sure if you have hard water? If you have soap scum, you probably do have it. Other signs that you have hard water include spots on your glasses or dishes after they’ve been through the dishwasher, stains that look like rust in your toilet bowl, and faucets or shower heads that get clogged and dirty. With very hard water, you might even notice a strong metallic odor. Every time you use soap and water, a new layer of soap scum forms over the existing one, creating multiple layers. These layers trap skin flakes, among other organic substances, and produce a microbial biofilm which includes harmful bacteria. When water hits the soap scum on your shower walls or shower curtain, this bacteria bounces onto your skin and becomes airborne in steam. So, yes, it can be harmful. Fortunately, this homemade soap scum remover easily gets rid of it and treats the bacteria, too. • Switch to body wash. Synthetic soaps like body wash don’t contain the organic fats that bar soap does. As a result, they’re less likely to create soap scum. • Soften your water. In areas with very hard water, installing a water softener can not only reduce soap scum but also get your clothes and bodies cleaner, and prolong the life of your other appliances. A water softener system removes the calcium and magnesium ions in water. The result is more effective cleaning with less buildup and scale clogging your pipes. • Keep it clean with this spray. A quick once-over with this daily homemade shower spray will keep soap scum from returning. It also prevents mold and mildew, too. • Help with cloudy glass shower doors. If your shower doors look like they’re etched with hard water spots, you need to scrub them with a stainless steel pad and a homemade soft scrub mixture. Rinse well afterward and then use this Homemade Soap Scum Remover on the tub walls and floor for a sparkling shower that looks like new. Do not use this on granite or natural stone! If your shower is made of granite, marble, travertine, or other natural stone, this is not the solution for you. Instead, try my homemade granite cleaner recipe. 1. Using a measuring cup, add equal parts VERY hot vinegar and Dawn dish soap to the spray bottle. To do my shower, I need 1 cup of each. 2. 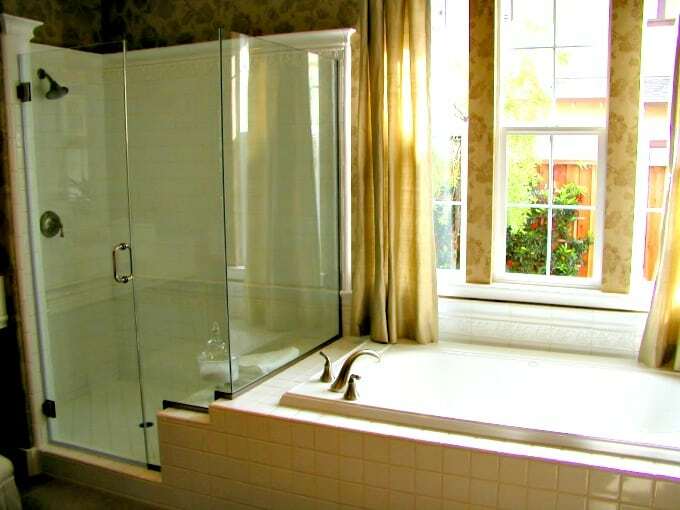 Heavily spray the shower door or surface that you want to clean. The solution will cling. That’s good. 3. Let sit at least 30 minutes. Overnight is even better. 4. Rinse while wiping with a microfiber cloth. 5. Scrubbing hard probably won’t be necessary, but if there are particularly stubborn spots go at them with a stiff-bristled brush. I’ve just discovered this site and I’m finding it really helpful to become better organised. Thanks so much Katie for taking the time to set it up and maintain it. 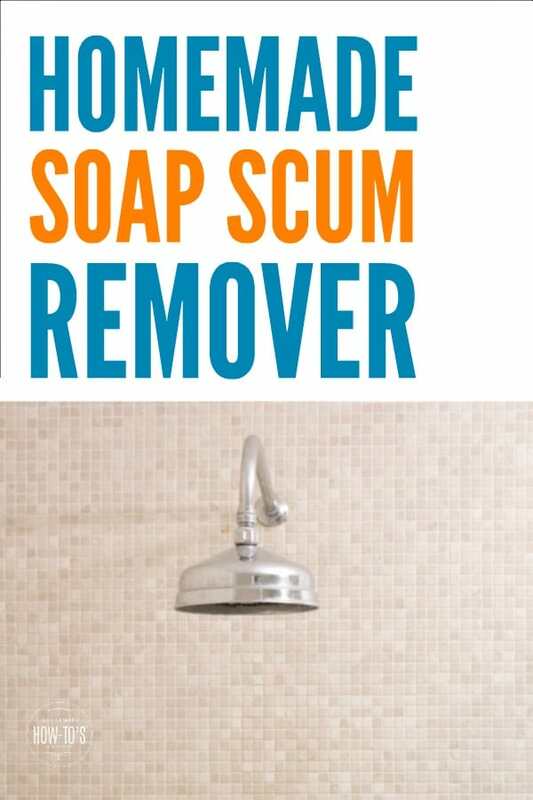 I have a question about your Soap Scum Remover. You say to use very hot vinegar when making it. Do you need to put it on the shower glass and tiles while it’s hot or does it work when cold also? Hi Sandra! I’m glad you’ve discovered my site. Come join us on the Facebook page (http://www.facebook.com/housewifehowtos) for even more tips! As far as the soap scum cleaner, yes, it needs to be applied when the vinegar is hot. That helps break down the soap scum so the rest of the ingredients can do their work. Used this the on Wed this week 20 nov2013, Got a cheap spray bottle from wall-mart and went to town. Here is the good an bad. Environment: My shower, standard shower/bathtub with shower curtain, nothing to note here. Typical Cleaner Used: I live in a Apartment, middle High to High end, so while I clean and what my deposit back I don’t over do it. Usually as I take a shower I grab a Mr Clean Magic Eraser and scrub away, it has worked good but I always wondered if it disinfected or not, plus they cost a bit of cash, and I’m a Iraq Vet in college so money ain’t falling off of trees. Setup: So while I was using another item from this site (furniture polish and wax remover, I recommend that U try it at least once) I mixed the cleaner per instructions, and doubled the recipe to fill the whole spray bottle. I used White Vinegar, Walmart brand, water from the tap, and Palmolive Dish soap, (it had oxy clean in it, the only one I had at the house)more on that later. Bathroom Area: We have (my wife and I ) a removable shower head which came in super awesome when cleaning time comes. So I removed all items and razors, brushes etc. And I took off my suction cup shave mirror, and two suction cups plastic corner shelves by OXO, (they are great shelves) but are covered in soap scum. I sprayed the mix all over and on the shelves inside everywhere. Here is where the Oxy in the soap I think came in, cause it was rough, and I have burned human poop in Iraq before. But It was fast spray. A hour later when back in with a Teflon safe old scrub pad. You know the type you can use on Calphalon Pans, and has a sponge side. So I took that and used water and that to clean it up. I will say it WORKS BETTER than anything else I have ever used, and I used all types of stuff. Even the plastic shelves which I had no hope for, were cleaned like brand new. Washed the excess off and let it all air dry. You will need a funnel of some type, or you will have hot vinegar allover the place. Also get the good spray bottle at wall mart, the $1 is not worth it at all. The smell is hard to take, but that could of been the Oxy getting airborne, use any soap just don’t use that. I’m trying this right now. I found out that some spray bottle deform/melt if the vinegar is too hot. Who knew! What, actually exercise?! *sigh* Yes, I definitely need to start doing that. Thanks for letting me know Ivory worked just as well. I love that stuff, too! And to keep that shower door clean after you get the soap scum off, use a squeegee after every shower. We use one in ours and it only takes a couple of seconds to get ‘er done right after you turn off the tap! I really need to get better about using the squeegee. My husband refuses to use it, but since my showers follow his it doesn’t really matter. The question is always: have I had my coffee yet? If not, then my brain just can’t wrap around cleaning. LOL, you lady of leisure! Definitely going to have to try this- we have a curtain, not doors, but we get lots of soap scum on the tiles in the shower itself. Thanks! Shell, it should work just as well on tiles, but be careful about it getting on the floor of the tub. It’ll be slippery as all get out when you climb in to wipe those tiles! Please, do! Mine does have that metal surround, so I sprayed this stuff in the nooks and crannies then got out an old “spin brush” toothbrush and whirled it clean. It works so well! Our shower door was naaaaaaasty when we first moved in. (Naturally, it was sparkling clean when we bought the place. Go figure.) I fought with and fussed about the soap scum for ages before trying this. Best part, we were homeschooling back when I first tried this, and I got distracted by our school day after spraying it on. When I came back that evening and saw my shower door still goopy, I was certain I’d just made more work for myself, but it was just the opposite! The stuff wiped right away, and took the soap scum with it. Hooray!